Errors in the report prepared by the John Jay College of Criminal Justice on sexual abuse by Catholic clergy leave unanswered one of the central questions the report was supposed to answer: How did church leaders respond to allegations of sexual abuse? The report has been removed from the World Wide Web site of the U.S. Conference of Catholic Bishops following discovery of errors in the section describing how bishops and religious superiors dealt with allegations of sexual abuse. There is no indication that other sections of the report have significant errors. At press time the report was still available on the John Jay College Web site (www.johnjaycollege.edu). America discovered errors in the graphic while preparing it for use on the cover of this week’s issue. An official at the U.S. Bishops Conference who was asked why the percentages and the raw numbers in the figure did not match, expressed surprise and referred the questioner to the John Jay College of Criminal Justice, which prepared the report. Within hours of America’s query, all but the executive summary of the report was removed from the bishops’ Web site and replaced by a notice stating that the “report is undergoing final editing” and will be available in late March. Margaret L. Smith, data analyst for the John Jay College research team, acknowledged in response to questions from America that Fig. 5.3.1. showed incorrect data. At press time, no revision was available. Differing definitions of the word “substantiated” appear to have caused problems for researchers at the John Jay College of Criminal Justice as they analyzed data from the survey questionnaire sent to diocesan officials to collect information on sexual abuse by clergy in the United States. The investigators discovered from notes on the returned questionnaires that respondents had used various criteria for determining whether an allegation was “substantiated” or not. Some may have taken “substantiated” to mean “credible,” others “proven beyond a reasonable doubt” or something else. No written definition of the term had been provided to diocesan officials by the researchers. In addition, this question was asked only about cases investigated by the diocese, not about all cases. The report released on Feb. 27 did not contain any information on what percentage of the allegations were investigated by dioceses or what percentage were substantiated, even though these questions were asked in the questionnaire given to diocesan officials. The principal investigator for the report at John Jay College, Karen Terry, told Catholic News Service that according to the survey data, church officials substantiated allegations against about two-thirds of the 4,392 clergymen accused of sexual abuse of minors during the 52-year time period from 1950 to 2002. Terry said the fact that some of the allegations were unsubstantiated does not mean they were disproved. Margaret Smith, the study’s data analyst, said that the two-thirds figure was based on a combination of factors involving cross-checking with other questionnaires to see, for instance, if disciplinary actions were taken against priests, even though no investigation results were reported. 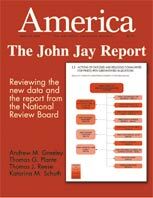 Data provided to America by John Jay researchers seems to indicate that 65 percent of the allegations were investigated by diocesan officials, and that of this number 65 percent were judged “substantiated” by those officials, although the survey questionnaire had left the word undefined. The confusion over “substantiated” adds to the problems of Fig. 5.3.1, which was meant to report the response of bishops to “substantiated” allegations.